Astronomers say that they have discovered the first example of a long-sought cosmic oddity: a bloated, dying star with a surprise in its core — an ultradense neutron star. Portrait of a star about to go supernova. 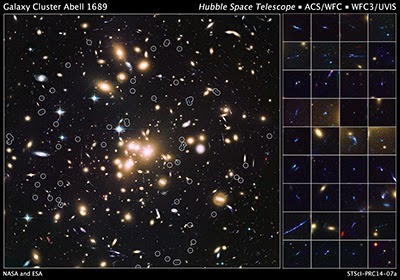 The Hubble Telescope has imaged 58 young, small galaxies, part of a vast sea of faint galaxies that existed more than 10 billion years ago, during the heyday of star birth. 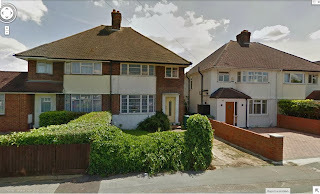 The house formerly owned by J.G. Ballard. 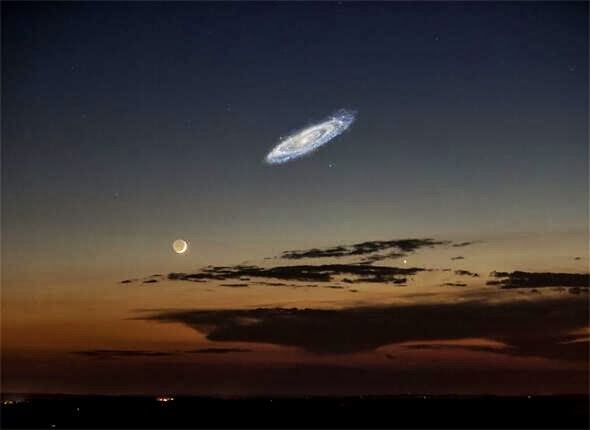 This image of the Moon and the Andromeda galaxy in Earth's night sky (made from an original photo of the Moon taken by Stephen Rahm, and an ultraviolet image from NASA's GALEX mission) was all over the internet last week. It shows how big the Andromeda galaxy would seem if the entire span of its spiral arms was bright enough to see with the naked eye (usually only the core is visible without augmentation). The Andromeda galaxy is 140,000 light years across, but it's 2.5 million light year away. The Moon is just 3400 kilometres in diameter, but it is of course much closer - a little over 360,000 kilometres away at perigee, or 1.282 light seconds. A nice illustration of relative distance and size. ﻿Framed on one side by the bluff on which the Aedile’s house stood, and by the chimneys of the paeonin mill on the other, the triple-armed pinwheel of the galaxy stood beyond the edge of the world. It was so big that when Yama looked at one edge he could not see the other. The Arm of the Warrior rose high above the arch of the Arm of the Hunter; the Arm of the Archer curved in the opposite direction, below the edge of the world, and would not be seen again until next winter. The structure known as the Blue Diadem, that Yama knew from his readings of the Puranas was a cloud of fifty thousand blue-white stars each forty times the mass of the sun of Confluence, was a brilliant pinprick of light beyond the frayed point of the outflung Arm of the Hunter, like a drop of water flicked from a finger. Smaller star clusters made long chains of concentrated light through the milky haze of the galactic arms. There were lines and threads and globes and clouds of stars, all fading into a misty radiance notched by dark lanes that barred the arms at regular intervals. The core, bisected by the horizon, was knitted from thin shells of stars in tidy orbits concentrically packed around the great globular clusters of the heart stars, like layers of glittering tissue wrapped around a heap of jewels. Confronted with this ancient grandeur, Yama felt that his fate was as insignificant as that of any of the mosquitoes which danced before his face.